Last May, Apple subsidiary, FileMaker, released version 14 of its market-leading multi-platform and cross-device application – now not so much a database as an app itself to create all manner of apps in their own right. Data, applications built for and using that data, as well as its retrieval, manipulation and presentation are all dealt with seamlessly across web, handhelds, tablets, desktops, mobile devices and all common operating systems. MyMac was impressed with this consolidation and integration of services in June last year; but wondered whether the high price asked was justified in view of the relatively small number of significant new features offered. The same can be said of version 15. FileMaker Pro 15 goes even further in terms of making the use and exchange of data more transparent regardless of device and working environment. Indeed, it’s a delight to work with: the familiar speed, robustness, fluency, logical layout of menus, vast array of carefully-conceived features and the integration of all aspects of functionality regardless of device and platform are, of course, retained. For the majority of users, FileMaker Pro 15 deservedly remains the de facto standard. But there are relatively few actual innovations which would justify a minimum upgrade price of almost $200. 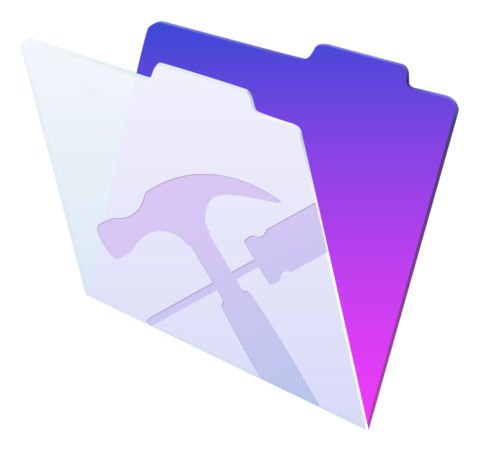 Although there are no major features, if you use FileMaker in such a way that you need to collect, edit and/or present a huge array of data types regardless of platform, then this release will also please. Pick your scenario: a real estate professional wanting to track and update multiple kinds of data… from locations, prices, offers, contacts, viewings and fully-illustrated property details regardless of where they are can do so using FileMaker Pro 15 with the utmost of ease. Or, for instance, a sportswriter can report, view, fact-check, research, maintain records etc whether in the office or in the field. Regular sales figures can be securely prepared and their presentation devised and built on a desktop machine and then quickly and easily displayed on an iPad in a hastily-convened meeting etc. Switching between devices and platforms reliably needs really smooth and seamless synchronization of data and database design. FileMaker really does appear to have overcome all imaginable obstacles and this everything always works extremely well. Each of the areas of functionality necessary to support such uses was tested during the course of evaluation for this review – and found to be as described, and wholly reliable: start data entry or modification of structure on one device and see it instantly reflected on those others which you have attached to the system. Once you really get used to taking advantage of these structures – whether or not you think that they’re worth the minimum price of $197 which you’ll pay for the single-user upgrade – you’ll be glad to have them. The folks at FileMaker have obviously thought carefully about ways to enhance the experience at many of the places where it really matters. It can also be safely assumed that a goodly number of bugs has been squashed in developing FileMaker Pro 15, and that it’s an even more stable and reliable product as a result. Looking through the list of what has been changed, removed and added (script steps such as truncating tables more efficiently and verifying SMTP servers’ SSL certificate, for example) reveals advances in housekeeping and consolidation that will make everyone’s lives easier when using FileMaker. Among the extensions specific to iOS in this new version of FileMaker Pro are Touch ID and 3D Touch, where your hardware and OS version support them; as well as cloud-based file sharing, iBeacon support and data exchange between apps. A new Adapter allows your FileMaker databases to connect with more ESS (External SQL Data Sources) including PostgreSQL and DB2 (IBM). This supports a live bi-directional connection to import and/or exchange data. Mindful that security is increasingly crucial to all data users, it’s now possible to replace the characters in strings representing such sensitive information as passwords and credit card numbers with the bullet symbol (“•”) symbol. You’ll also be warned – from within FileMaker – if you connect to a host or site with an invalid security certificate. 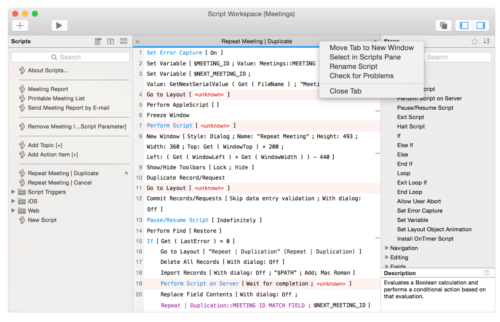 The Script Workspace has been changed to accommodate multiple undos… no change is committed until you both save and exit the Workspace. What’s more, text is now highlighted (in red) when there are errors there. Even for the casual FMP scripter, these are very welcome advances. There are four new “Starter Solutions” for those wishing to jump in and create a custom app almost out of the box, and without having to undertake significant research on structure or presentation: contacts, inventory, content, and tasks. The Status toolbar icons have also been redesigned. The Portal now has an in-line progress bar which appears while you’re filtering or sorting. FileMaker will now advise from within the product when updates become available… there are usually fewer than half a dozen within any one major release’s lifetime. There is also a new way to get Help that’s web-based, although its content can be downloaded and used offline. Conclusions: Nothing spectacular has been introduced in version 15. But those new and improved features in this version are welcome. Undoubtedly the aspects of integration, cross-platform and inter-device functionality – aspects of data management which the company has been rightly pushing for several versions now – have been tightened and improved. Pros: Extremely well supported as a system. Vast third party community. Has been reliable and feature rich for many years. Inspiring array of starter options; well documented; does all of what should – and is – expected of such a system. Cons: overpriced for a slim bevy of new features in this version.